A two-person delivery team turned up at the studio with three boxes containing the double sized eve Bed Frame and headboard (it’s only two boxes without a headboard). It’s delivered to your room of choice and they’ll unwrap and take away the packaging if you ask. Immediately obvious was how quickly the frame turned up (3 days from ordering) when compared to many established bed-ware shops that can easily take from a few weeks to a month or more to get the frame delivered to more remote areas like ours. Admittedly the simplicity of the eve Mattress, that arrives in a box and expands when pulled out of it’s packaging, isn’t quite the same story with the eve Bed Frame. That’s not to say it’s a chore to put together. Every step is clearly detailed in eve’s included booklet and positively one small spanner (which has its own sewn-in pocket to live in) is the only tool you’ll need to use. There’s no glueing, drilling or hammering here. To start off, we bolted the three frame sides and headboard together. If you don’t opt for the £200 optional headboard, there'll just be four sides to put together and either way the process is identical. Then we equipped the solid ash legs and finally laid the bi-fold pre-slatted sprung beech frame on top. This is the trickiest step as it needs to be unfolded and requires two people, one on either side of the bed frame, to drop it in place squarely. However, this procedure rewards with huge time savings, as we didn’t need to measure for the spacing between slats or have to manually screw each into place. The eve Frame is a perfect canvas for the eve Mattress to show-off upon, there’s no wasted space or indulgent trimming. So if you’re looking for a bed frame with a proper headboard in a thin design that has an airy quality, the eve is one of the best options we’ve yet to see. Our double frame is only 9cm longer than the mattress, with a total length of 199cm, and 6cm wider at a total of 141cm. In terms of build quality, due to each corner being connected with steel brackets and the slatted base itself housed in the same material, it's a solid unit - hence a 5 year warranty. Furthermore, the headboard rids the notion of needing a pillow to support your neck or back whilst upright reading a book. Cushioned with a layer of foam, it’s as comfortable to lay against for prolonged periods as a sofa. An optional extra we’d highly recommend! Most loved is eve Frame's crisp straight sides covered by what is a joyously upholstered soft grey Italian wool cover that stays light in tone both when under sunlight and when the sun rests in the evenings. There’s a definite contemporary Scandinavian attitude about this frame, particularly when married with the gorgeous angled ash legs, with grips on each, that hold the frame 20cm above the floor. Incidentally, this space could be used to cleverly hide a tote with bedding if you’re pushed for space, but some eve storage designs would be welcomed. Fundamentally this is a versatile look that will suit anywhere from loft apartment styled bedrooms with white walls and attentive decor, to rustic cottage settings with exposed granite. Or, proving the diversity of residences the eve Frame can live in, ours is even more obscure - a wooden cabin setting that it merges together with effortlessly. What’s it like to sleep on? When we compare it to other slatted frames we’ve used and reviewed, like the Barcelona Bed Frame, the eve stands out as having a lot more give. The eve Mattress doesn’t really exude a significant springy characteristic, so the frame is rather complementary to it. When you get in and out of bed, the eve Frame will subtly depress because the beech slats are arched and so exhibit an optimised springy character when compared to traditional straight slats. Despite this the frame isn’t an offender for creaks when getting into bed or when turning over during the night. Getting to sleep on the eve Mattress is always a pleasure, as we’ve previously divulged, and the combination here is a restful match. 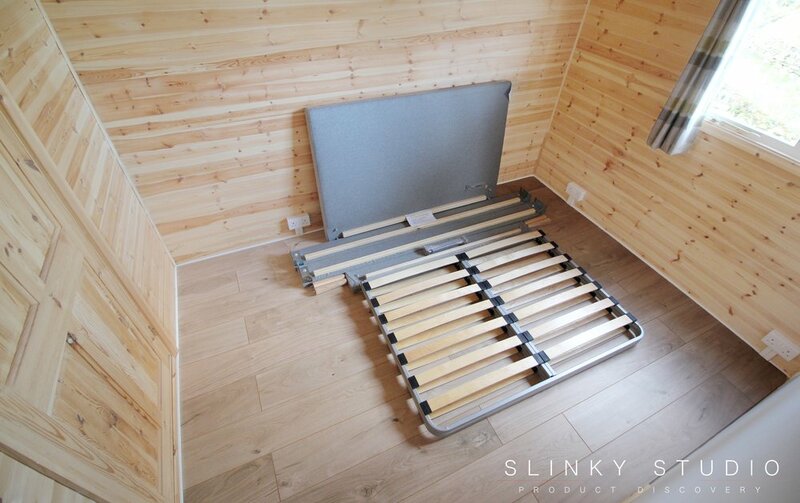 Added to this, the breathability of the mattress is promoted because of the space between the slats, whereas a divan-styled frame definitely heats up this style of mattress in the summer months from our experience. A less stressful and more orderly affair. eve have succeeded in simplifying the bed frame buying puzzle with a 3-5 day delivery and a quick assembly process that only requires a spanner. So if you want a bed frame that exudes contemporary style with a premium Italian wool finish and is conscious about space, this eve creation is a superb choice backed by a 5 year warranty.